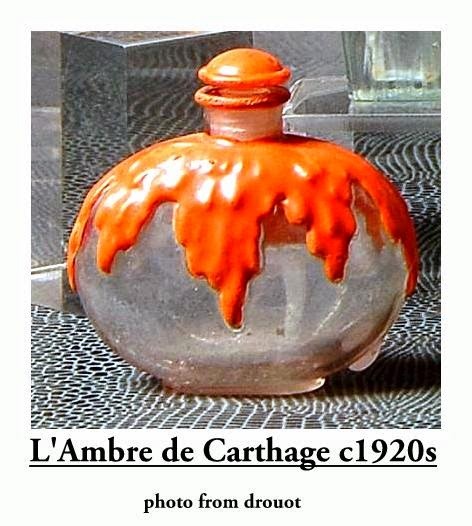 L'Ambre de Carthage by Isabey: launched in 1924. 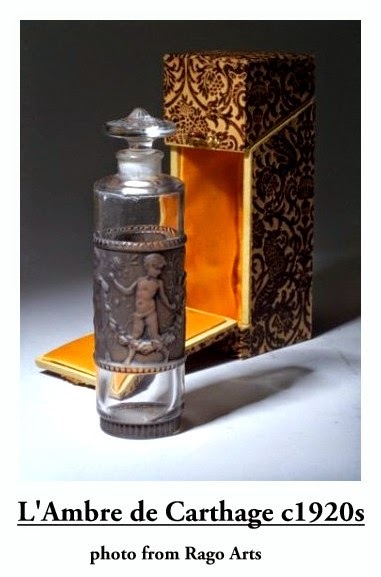 Originally created by perfumer Jean Jacques as a woman's perfume. 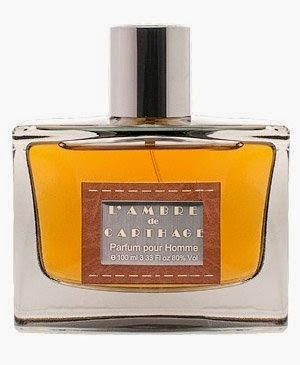 The name evoking the ancient Tunisian city of Carthage. So what does it smell like? I have no notes for the original perfume. The perfume bottles were designed by Julien Viard. 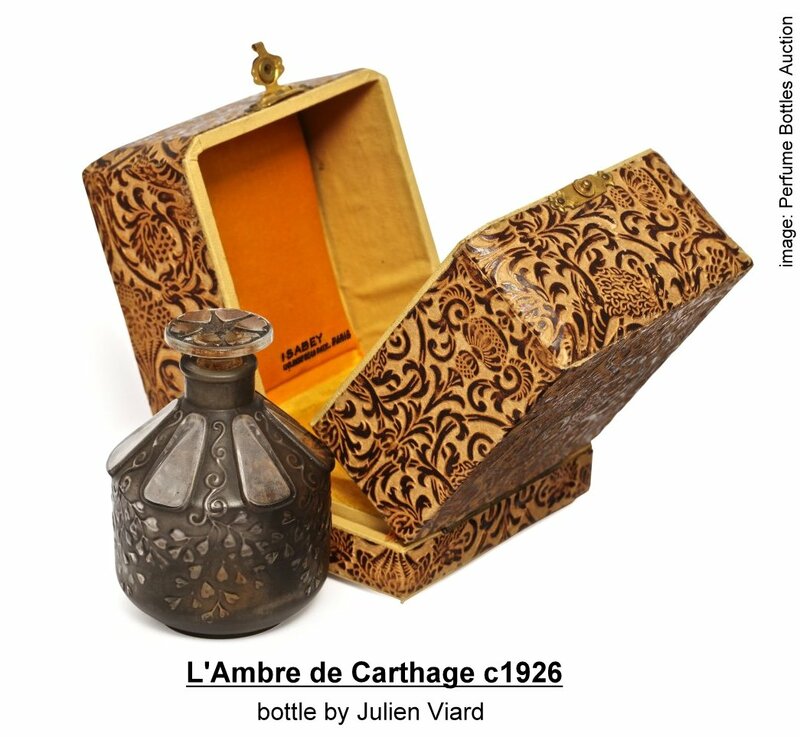 1926 Julien Viard designed Ambre De Carthage perfume bottle and stopper, made up of clear and frosted glass, accented with gray patina. Original box with stylized scrolling floral pattern. Bottle stands 2 3/4" tall. 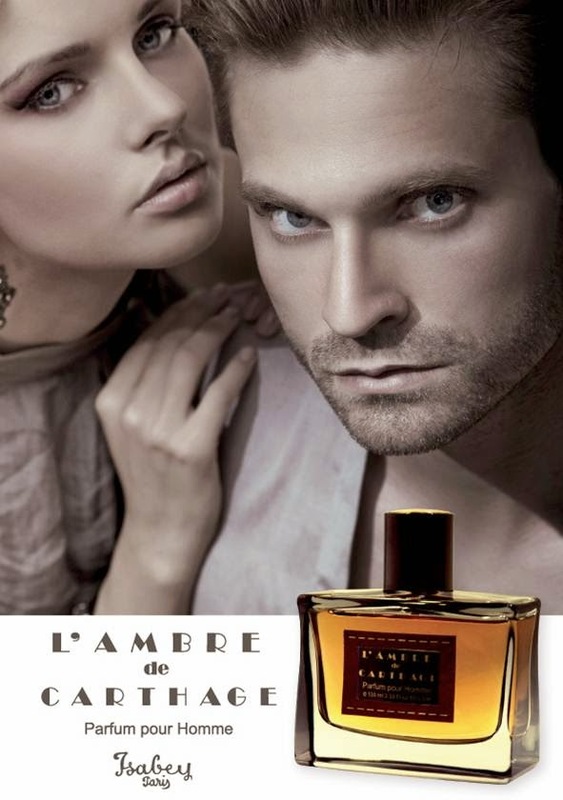 In 2011 saw the launch of the first men's fragrance by Panouge under their Isabey label, called L'Ambre de Carthage, created by Jean Jacques. The name was recycled from the perfume originally launched in 1924. I received a sample from Panouge and just applied some to my arm. At first sniff I get olibanum incense. Lots of incense. The incense reminds me of Tom Ford's Sahara Noir. An herbal facet from the thyme, a pungent spike of geranium and a spice fusion of cinnamon and cardamom add to the oriental composition. I didn't get much of the floral notes of the jasmine or the osmanthus. Slowly the amber emerges from its slumber. I get a touch of earthy woods with the patchouli, birch and sandalwood.